Jason Williamson's 15-11 stringer was topped by a 6-10 brute. Catching a bass that weighs more than two pounds at Winyah Bay is a reason to rejoice. Catching one more than three times that size can threaten to send an angler into cardiac arrest. 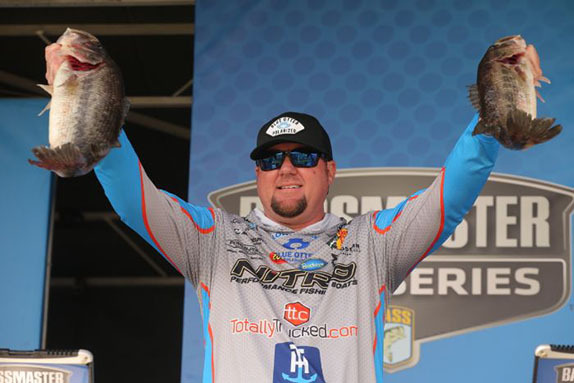 Jason Williamson boated such a fish on day 1 of the fourth Bassmaster Elite Series event of the season near the South Carolina coast. 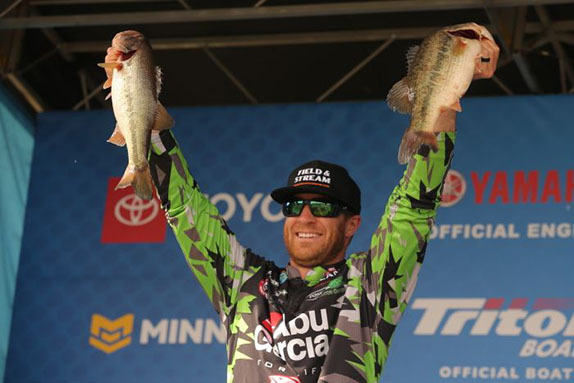 It highlighted his 15-11 stringer that topped the 75-angler field. "I about had a freakin' heart attack when it came up," Williamson said of his bruiser. "On a fishery like this, when you catch a 2 1/2-pounder you're like, 'Thank God for that one.' When you catch one like the one I had today, it changes your whole world." 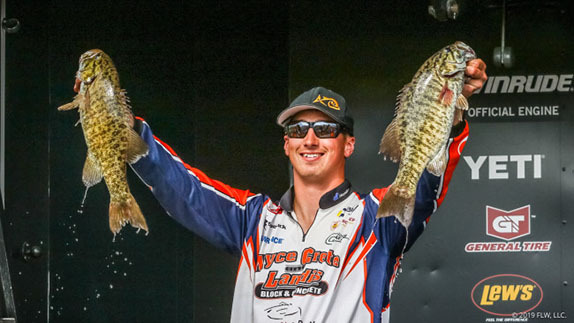 Hunter Shryock was the only other competitor to surpass 15 pounds (15-08) on a day when the wind blew hard from the east and thwarted the game plans of anglers who made the long run to the Cooper River, never allowing the tide to bottom out. Rookie Luke Palmer was 3rd with 14-02, followed by Bill Lowen with 13-04 and Clent Davis with 12-14. The lower half of the top 10 consisted of Garrett Paquette (12-08), Clifford Pirch (12-06), Yusuke Miyazaki (12-01), Scott Canterbury (11-15) and John Crews (11-13). Only the top 20 managed to surpass the 10-pound threshold. The No. 35 spot, where he cut line will fall after the day-2 weigh-in, was occupied by Mark Menendez with 8-10. 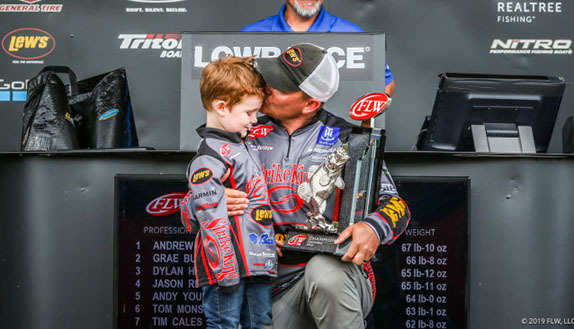 Brandon Cobb, the winner last week at Lake Hartwell who's 2nd in the Angler of the Year Race, and AOY leader Drew Cook, who finished 4th at Hartwell, were 39th and 40th, respectively, after day 1. Cobb weighed 8-07 and Cook boxed 8-05. The wind is predicted to switch to a more southerly direction on day 2, which could help the competitors making the voyage to the Cooper, considered the most fertile of the five rivers in play this week. The trip can take as long as two hours each way and some anglers were forced to fuel up both coming and going on day 1. Neither Williamson, who has two wins on the circuit but none in the past nine years, nor Shryock ventured to the Cooper. Both declined to disclosed which river they fished. Hunter Shryock isn't getting a lot of bites, but he's around some high-quality specimens. "I got a lot of bites in practice, but as far as quality, I had no clue," Williamson said. "Mostof the bites I shook off and they seemed to be the typical 7- to 9-pound limit-type fish. I never shook off any that I thought was over 2 pounds. "I did lose a 3-pound-class fish, but otherwise, it was just my day and luck went my way. I caught them in a couple different areas and I had a good many boats around me. What I'm doing's not a lot different than most guys � I'm flipping and pitching creature baits around. I was one of the guys today who got a couple good bites." Shryock said he had a mediocre practice in terms of bite numbers, but the size was encouraging. His biggest day-1 specimen was a 4 1/2-pounder. "I was only getting a couple bites a day in different areas, but I knew they were some better quality," he said. "My biggest concern today was getting a single bite, but I knew if I could get one, it was typically going to be bigger than average." He had seven bites and landed six of them. He lost one fish that would've helped him, but he doesn't know how much. "It's hard to say if it was a 3-pounder or a 5- or 6-pounder when it comes off in the middle of a bush or tree. It was a good fish, but to have caught what I caught under the conditions, it was still a pretty good hook-to-land ratio." Palmer did his damage from a place in the Cooper where he'd caught a 4-pounder on the second day of practice. His day-1 haul included a fish that was a pound larger than that, and also a solid 3. "It was kind of one of those deals where I more or less expanded on a little bitty area I'd found," he said. "I actually didn't start where I wanted to because I had a couple of bed-fish I wanted to catch, but the tide didn't go all the way out because the wind kept it in. 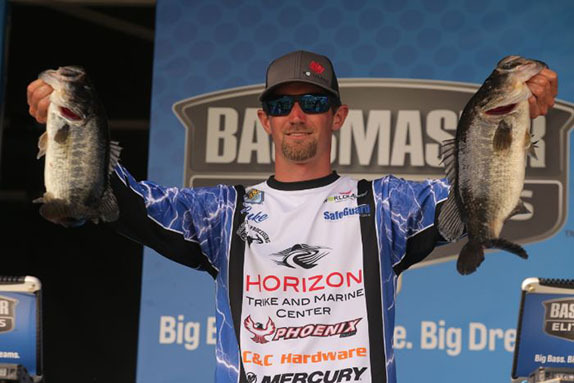 "I had a couple miss (his bait) at first, but I kept going through the area and started catching one or two every time. I had it to myself until (photographer Steve) Bowman showed up and started taking pictures and stuff, and then guys started easing toward me. I was there by myself for three hours and I hope guys will respect that (on day 2)." Luke Palmer caught his 14-pound stringer from a single stretch of hydrilla. He'd have preferred not to fish the stretch for as long as he did, but felt like he had to protect it. "I didn't want to hammer it, but I didn't want those other guys getting on it, either." 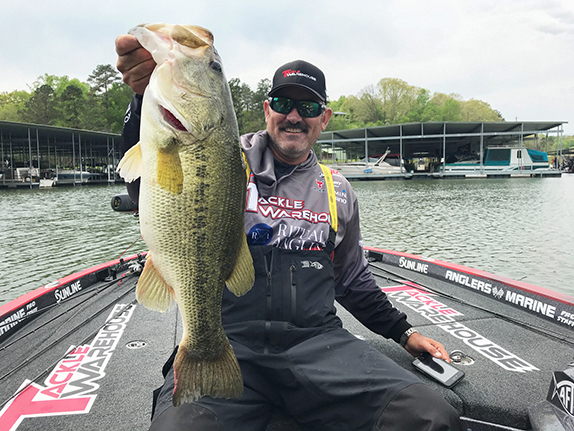 Chris Zaldain, a tidal-water stalwart from his days growing up on the California Delta, started the day brimming with confidence due to what he found in the Cooper during practice. However, he managed just a miniscule limit (6-08) on day 1. He pointed to wind direction as the culprit. "My hopes were high because I knew what was going on with the fish there, but we had a brutal east wind today that was pushing up against the eastern shore," he said. "We didn't really see the low tide � the water kind of stayed in. I couldn't see the ditches and the stuff I was targeting. "In 2016 (the last time the circuit visited Winyah Bay), the day the wind blew from the east, nobody caught them. I did get a look at a 4-pounder that ate the bait, got hooked and then turned and came off. I'm still around quality and I'm going to do the same thing tomorrow that I did today and hope we get a low tide. "It'll be more of a low-pressure day tomorrow with clouds and some rain and it should be better." > Day 1 stats � 75 anglers, 62 limits, 5 fours, 1 three, 3 twos, 3 ones, 1 zero.